Posted December 7, 2018, in News. 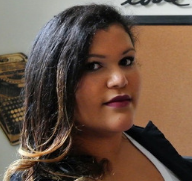 2016 MFA alumna Micaiah Johnson’s debut science fiction novel, The Space Between Worlds, has been acquired by UK publisher Hodder and Stoughton, with US rights selling to Crown. The novel is planned for a simultaneous publication in the US and UK in 2020. Page last updated by Master of Fine Arts in Creative Writing at 9:37 am December 7, 2018 . This page was printed from http://mfa.camden.rutgers.edu/2018/12/07/debut-novel-by-alumna-micaiah-johnson-to-be-published-in-2020/ at 6:48 PM Monday, April 22, 2019.